Each episode of the ABC’s excellent series Ancient Megastructures comprises a 50-minute exposé of one of the most awe-inspiring structures ever created by man. Drawing on the expertise of numerous professors, historians, engineers and other specialists, the series paints a vivid picture of the planning and execution of these timeless monuments. 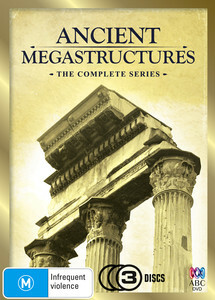 This is an first rate series, with strong visuals and a soaring Dolby Digital 2.0 audio track, and all in all Ancient Megastructures provides a polished and enlightening glimpse at the architectural marvels of the past. The re-enactments, narration and overall attention to detail are impressive, and anyone with more than a passing interest in history or engineering will find much to recommend it. The background to each of the constructions, as well as their historical context and religious significance is also brought to light in impressive detail, and each episode proves comprehensive, satisfying and awe-inspiring.